Some migrants, unable to cross the border, have chosen to wait out the storms exposed on the bridges connecting the United States and Mexico. The Trump administration's “zero tolerance” immigration policy, which led to the separation of children from adults who crossed the border illegally, has fueled a national outcry. Sign up for our ongoing coverage. Send story ideas to tips@texastribune.org. Days of heavy rain and flooding in South Texas have prompted Gov. Greg Abbott to issue a disaster declaration for six counties — including areas that have been ground zero for the ongoing fallout from the Trump administration's "zero tolerance" immigration policy. The area, which includes Hidalgo and Cameron counties, has been waterlogged for days, and rains continued unabated Thursday. The National Weather Service issued a flash flood watch for the Rio Grande Valley until 7 p.m. Thursday. “As severe weather and flooding continue to impact parts of Texas, our first priority is to ensure the safety of our fellow Texans in harm’s way,” Abbott said in a news release. Abbott's disaster declaration also includes Aransas, Nueces, San Patricio and Willacy counties along the coast. Near Weslaco, 16 miles outside McAllen, abandoned cars and trucks lined the access roads onto US Highway 83. 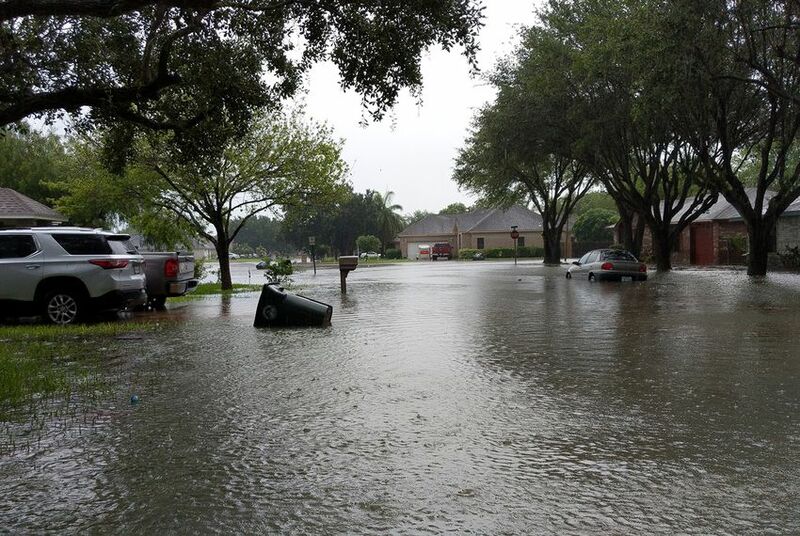 In Mercedes, shoulder-level floodwaters overtook cars, a KRGV reporter tweeted. Along the border, migrants have camped in the wind and rain as they wait for border patrol agents to let them cross the international bridges into cities like Hidalgo and Brownsville. On Tuesday night, migrants seeking asylum at the Brownsville port of entry slept on the bridge over the Rio Grande in the midst of flash flood and tornado warnings. Border Patrol processing centers haven’t gone untouched by the storms, either. The roads leading to some centers have flooded, and on Thursday, first lady Melania Trump canceled a tour of the Ursula Border Patrol Processing Center because of flooding. Juan Luis García Hernández and Neena Satija contributed to this story. On a bridge over the Rio Grande, immigrants seeking asylum wait for a chance to enter the U.S.